Last week, Sirius/XM Radio’s CEO Mel Karmazin said he wants Howard Stern to stay on after the shock jock’s contract is up at the end of the year. Of course, it’s all up to Howard. 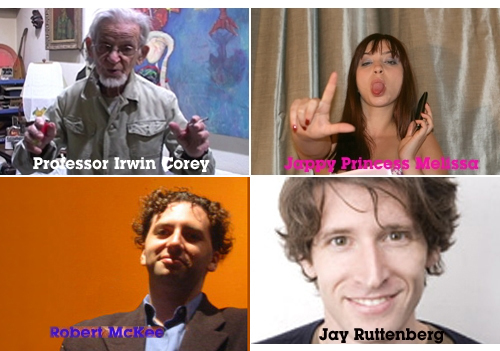 Heeb 100 alum Robert McKee, Lowbrow Reader publisher Jay Ruttenberg, fetishist phone operator Jappy Princess Melissa and 95-year-old comedian Professor Irwin Corey all weigh in on if the King of All Media will stay on. Ruttenberg: It would be a mistake for Stern to leave Sirius. His audience is famously loyal, and with good reason. He asked a lot of them to follow him to satellite radio — and in return swore his commitment to the new format. To quit at this point, over something as pedestrian as money, risks betrayal. How much of a cushion does this fantastically wealthy man need? While Stern has made occasional successful ventures in mediums other than radio in the past, I just don’t see him being fulfilled creatively outside of his show with Robin. Does the world really need Howard Stern’s Porky’s remake? Forget it. McKee: Howard has not known anything else but radio since the beginning of his adulthood. He’ll get shitloads of offers from cable networks and websites for post-radio offshoot projects, but will he really be able to find himself not behind the microphone? His Sirius gig has been one of the most lucrative and generous deals for anyone in the history of radio. Aside from the ridiculous amount of money, the guy gets all Fridays off and a very large number of Jewcations™, as people on SFN call it, throughout the year. Most of us Howard loyalists from the beginning would be very sad to see him go, but I don’t think anyone would be sadder than Howard himself. Besides, what the hell is he going to do all day? Schlep to the pool? I say he takes at least five more. Melissa: I think he will renew. The show might not be as long as the usual four-plus hours, but I don’t see Howard retiring. The fans are his therapy, and Howard needs his therapy. Plus I think Howard looks out for his people and knows most of them will disappear into oblivion without him. Howard stays. Corey: I don’t use the radio much.